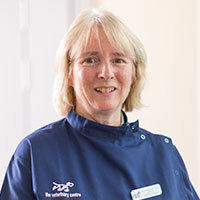 Appearing at the head of this list means that Jane has the dubious honour of being the oldest (or more politely, most senior) member of the veterinary team at Robson & Prescott. Born and reared in the more recent half of the last century just south of Skipton in Yorkshire she was finally forced to leave to pursue her chosen career at Cambridge University Veterinary School. Once qualified she returned 'home' to work in a very busy 2-man, mixed practice in Keighley. At that time, it was a very male dominated world but it did help to be the 'local lass'. After four years a change beckoned and she was lured ever further north to Morpeth where she thought she would spend a couple of years - that was over 20 years ago! Having acquired an ear for the language, adopted a terrier and two rescue lurchers and a husband, become one of the longest residents in her home village, taken up the tin whistle and just got an allotment, Jane thought she might as well stay! Jane specialises in being a GP, gets a thrill (and exhaustion!) from running a thriving, friendly practice, enjoys all things surgical (especially ears, bottoms and bones), likes to be 'let out' onto the farms and gets great satisfaction from problem solving with the clients.